An advocate of Big Coal and chemical companies could soon be in charge of environmental protection in the United States. Andrew Wheeler’s beliefs about climate change and the environment make him unfit to lead the EPA. Is he fit to run the EPA ? Sign this petition to ask the Senate to reject this unqualified and utterly inappropriate nominee. Goal: Do not confirm polluter ally Andrew Wheeler as the new head of the Environmental Protection Agency. Andrew Wheeler does not prioritize the environment. His track record as the acting head of the Environmental Protection Agency (EPA) proves this. We need the new head of the EPA to uphold the EPA’s mission statement of protecting human health and the environment. Wheeler is not the man for the job. 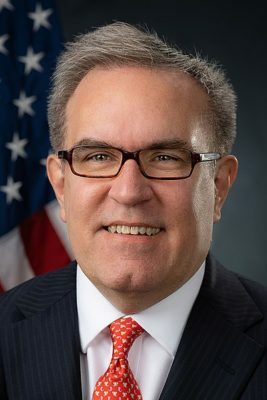 Andrew Wheeler became the acting EPA administrator in July 2018, when Scott Pruit resigned amid a serious scandal that he misused federal funds for personal gains. He is before Congress this week for his congressional hearing to officially lead the agency. Wheeler has a history as a coal, chemical and uranium lobbyist. He vehemently defends the Trump administration’s rollback of environmental regulations. He does not think that climate change is a crisis caused by humans that requires a swift response. His attitude and policies do not protect human health and the environment. He is unfit to lead the EPA. Senate Democrats spent much of their time during a confirmation hearing pointing out how far out of sync Wheeler’s track record is with the mission of the EPA. They accused Wheeler of tipping the scale in favor of the fossil fuel industry. Unfortunately, Democrats hold a minority in the Senate and will not be able to block the confirmation of Wheeler alone. They need Senate Republicans to take a stand for the environment. Join us in demanding that the Senate Committee on Environment and Public Works remember what the EPA was designed to protect. Do not confirm Andrew Wheeler as the new head of the EPA. In your capacity as chairman of the committee, you hold a good deal of power and influence when it comes to confirming the next head of the EPA. Andrew Wheeler is before your committee seeking confirmation. Please do not confirm him. The EPA was designed to protect human health and the environment. Wheeler’s track record proves that he will not uphold the mission of the EPA. He repeatedly works to deny climate change, lobby for fossil fuels, and repeal regulations that safeguard human health. Wheeler is not the person I want in charge of environmental regulations. I am asking you to not confirm Andrew Wheeler as the next head of the EPA. India: Introduction to 2019 With Some Amazing Rescues. Please Donate If You Can.